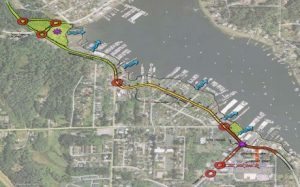 CTS completed the surveying and mapping of this 2-mile-long project corridor, and designed roadway, sidewalk and underground utility improvements on Harborview Drive, Judson Street, Pioneer Way and several other downtown city streets for the City of Gig Harbor. One of the primary objectives of the project was to widen the existing sidewalk along the waterfront, and to provide appropriate streetscape improvements. A segment of old concrete roadway is to be rehabilitated, along with replacement of an asbestos watermain and the provision of a new sanitary sewer. Drainage improvements are an integral part of the project, including the provision of a porous concrete sidewalk along the waterfront. The project included an extensive community-involvement program, and close coordination with City Council. Construction, due to start in 2009, was postponed due to funding issues.